Etihad Airways is the national airline of U.A.E that came into existence in 2003 by Royal (Amiri) Decree. Just in 10 years, Etihad has not only built itself as the world’s leading airline but also has developed into one of the fastest growing airlines in the history of commercial aviation. 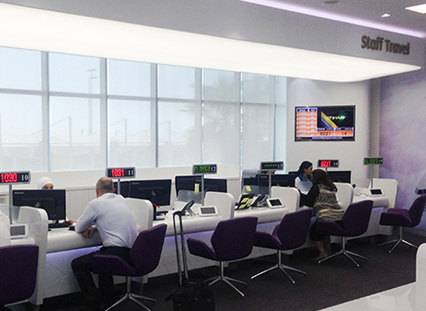 Etihad’s employee center is a primary resource touch point for all its employees. The center offers services and information on employee benefits, payroll, health insurance, visa & government services and much more. Considering Etihad is a very versatile and global airline, it employs people from every part of the world. This results in massive footfall where HR staff finds it challenging to cater to all requirements in optimal service time. In order to facilitate Etihad employee experience better service quality and eliminate crowded waiting areas, Wavetec’s queuing solution was integrated. After detailed understanding of customer requirements and user flow, Wavetec installed and integrated a complete Wavesphere solution which included Queue Management System, Digital Signage and Customer Feedback Unit. Etihad Employee Service Center attracts huge number of employees due to which service center was getting extremely crowded. Employees of Etihad Airways were going through a great deal of hassle due to long queues and increased waiting time. This led to frustration among employees hence Etihad Airways was in desperate need of proper flow management system. Wavetec implemented its complete Wavesphere solution which follows the philosophy of Organize, Engage and Measure. This philosophy helps companies implement a holistic approach thus enhancing customer experience at key touch points. A complete queue management system was implemented which comprised of an interactive touch screen kiosk with a functionality of a dual printer. The dual printer functionality ensures smooth operations as it acts as a backup printer when paper roll finishes. Queuing system also comprised of counter display units which are used for customer calling and have the functionality to show messages in both English and Arabic to cater to a diverse employee base of Etihad. Once the ticket is issued the employee waits for his turn. As his turn approaches, his number is called and is also displayed on counter display unit so he is directed to the right Etihad Representative. Company operators use a customized customer calling software which is installed on their computers and then linked to the main reporting system which ensures real-time dashboard reporting. The system is a complete enterprise solution for Etihad service centers. Managers are able to access centralized reporting system from any location and are able to monitor key performance indicators. System is also intelligently integrated with Etihad’s KPI’s thus, generating real-time alerts when service levels are gone down. 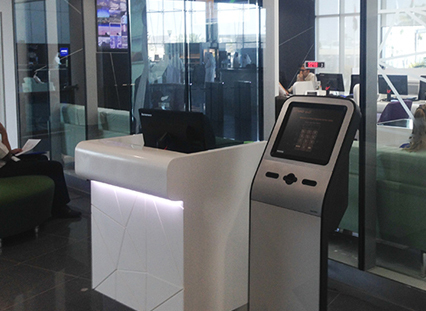 Donatello, a complete digital signage solution was also implemented at Etihad employee service centers which are then integrated with Wavetec’s queuing system. Integration allows the LCD screen to show real-time queue information therefore making waiting areas more informed and engaged. Donatello ensures an effective digital communication platform for employees in wait and reduces their perception of the waiting time by providing relevant information. Gathering feedback is integral for any service organization, especially Etihad. In order to serve employees better and understand service downfalls, Wavetec installed Opinion Plus, a customer feedback system which allows employees to give their input and feedback on the service. While being served, the employees can register their complaints and suggestion/feedback which is then displayed on a real time dashboard at the management level. Furthermore, the performance of each operator is linked to the feedback provided by Etihad employees of by integrating it with Wavetec’s Queue Management System. Wavetec’s Queue Management System installed at Etihad now allows employees to experiences a clear and visible flow with real-time reporting mechanisms, thus reducing uncertainly and increasing operational efficiencies.